What does it mean to be a data-driven company? 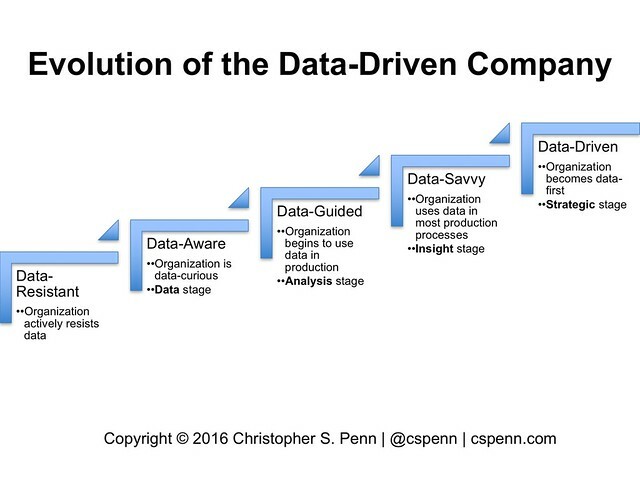 At several events this year, I explained how a company evolves, makes the journey to becoming data-driven. It’s not a process that’s fast or easy; becoming data-driven can take years. Making the transition out of data resistance is typically an entrepreneurial effort from within; someone who needs performance to improve in their domain begins to harness data without an organizational mandate. A data-aware company is curious: what’s in the data? What riches might it hold? The transition from data-aware to data-guided comes from a desire to unlock the value of the data a company has gathered. The data-guided company unlocks tactical value from its data: “let’s not do that again” and “let’s do more of that”. It uses findings from its data in production. Many companies get stuck in the data-guided stage for years – the tactical wins are enough to satisfy stakeholders. The transition into data-savvy typically occurs after the parade of vendors and tools gets old: “What are we spending all this money on?” is the question we’ll hear in an organization ready to make the leap to the next phase. The data-savvy company realizes that the value of data isn’t just tactical; data can be a strategic asset. To develop that strategic value, a data-savvy company continues its investment in the what but then turns its attention to why, to the development of insights. Why did sales dip last quarter? Why did consumers buy less of our product? Why did lead generation spike in the fourth week of the month? Why did X work but Y didn’t? The data-savvy company develops insights; by definition, insight means to look within. No amount of tools or vendors will substitute for the inward investigation into our data and analytics practices. Even when we look out through tools like surveying and ethnography, we are still looking at what we can do internally in our organization to explain why something happened. The transition into a data-driven organization occurs once we’ve developed concrete insights into what happened and why. Once we deliver these insights to our stakeholders, their first question should be, “Okay, so what are you going to do about it?”. This is the trigger to become data-driven. Based on the data, we should increase investment in X next quarter by 23%. Our analysis of why our email marketing failed indicates our campaign wasn’t mobile-friendly; all future campaigns will be responsive in design. When asked, our customers told us they hate our neon orange product color; through testing and surveying, a muted gold color will prove to be more customer-friendly. The decisions made by data-driven organizations encapsulate the data, what happened, why, and what next in clean, concise statements which indicate the next action to be taken. Data is a strategic asset that powers every major decision made; in a truly data-driven organization, every planning meeting begins with data, and no decision is executed without a governance structure to collect and measure the decision. The evolution of a company into a data-driven organization begins with entrepreneurial efforts, but at the end of the process requires adoption throughout the organization. Without buy-in at every level, an organization cannot become truly data-driven. That said, even if an entire company does not become data-driven, you as an individual stakeholder can adopt data-driven practices to improve the part of the organization you have control over. These five stages aren’t just organizational distinctions; they’re also the map of your career as you become a data-driven professional.